I think pretty much everyone I know was freaking out about getting their legs out during last weekends heatwave. It was amazing, and such a liberating feeling to not wear tights, but the first day of exposure, the big reveal, is always terrifying. The only way to get over this fear is by making sure you are prepped weeks before the summer finally hits. So, now is the time. By prep, I mean exfoliating, moisturising, and fake tanning, if needed. Fake tanners, as you know, exfoliating the skin to silky smooth perfection is the most important part of your routine, to eliminate streaks and a patchy finish. Of course if you’re not tanning, and have naturally dark skin like me, the winter and lack of Vitamin D can still make your skin look dull, so this is a perfect way to refine, and resurface skin, making it glow. 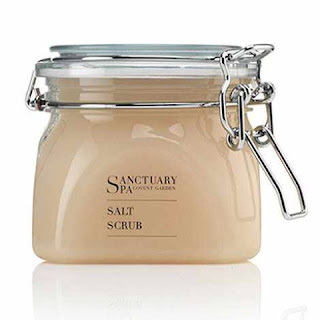 There are many exfoliators on the market, but I always go back to my original, and super reliable Salt Scrub by Sanutuary Spa. Out of all of the body scrubs I have used, and there are many, this has got to be my ultimate favourite. It’s fairly cheap, available from Boots and the pot is so huge, it will last you at least 6-8 months. This scrub contains Dead Sea Salt, wrapped in Jojoba oil, coconut oil, and sweet almond oil to transform your skin instantly. It smells amazing and will last all day. The texture is rough, thick and very oily. You need to give it a good shake, or mix when opened or else the oil rises to the surface and you will probably have to shovel the salt out in a few months. As mentioned earlier, it smells incredible and the oil feels so good on the skin. The salt crystals are super hard to touch, but they do exactly what they’re meant to. The salt is thick and hard but the richness of the oil will counteract the salt texture to give you a perfect balance for perfect skin. All you need to do is massage in circular movements onto damp skin concentrating on the areas that need it most. The almond and coconut oil absorb quickly and soften skin, and the Jojoba oil, a light and natural emollient is said to mimic the action of sebum to promote a radiant complexion. The sea salt removes dead skin cells, which improves the cell turnover. I used mine this morning and my skin looks and feels amazing. I’m a regular exfoliator and have been using anther (expensive) brand the last few months and today I can see and feel the difference. As soon as I got out of the shower my skin, especially my legs looked like they had lost a layer (gross) as they looked glowy, soft and the skin looked smother and tighter. Use twice a week or every other day (in moderation) over the summer.